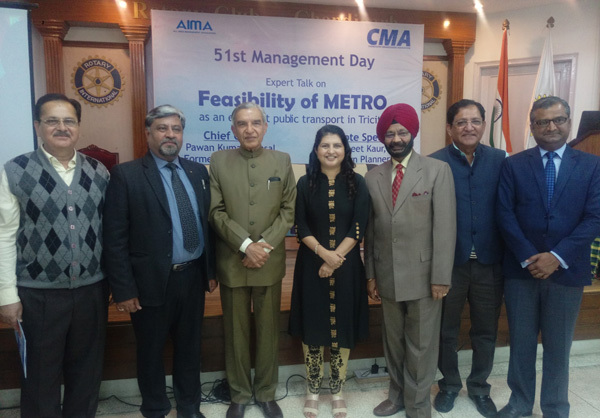 Chandigarh Management Association (CMA) celebrated its 51st Management Day on February 24, 2018 at Rotary House, Chandigah on the theme – ‘Feasibility of Metro as an Efficient Public Transport in Tricity’. Mr. Deepak K Dhingra, President stated that this is a visionary theme aiming at a well contained city with efficient people friendly transport system with minimum travel time and maximum safety plus comfort. The Chief Guest of CMA’s 51st Management Day, Mr. Pawan K Bansal, Former Union Minister, in his address stressed upon the need of Mass Rapid Transit System (MRTS) in the long run encompassing a larger geographical area keeping in view the number of vehicles and people that enter the tricity every month. Ms. Gurmeet Kaur, Sr. Town Planner, Panchkula enlightened the audience on existing facts and figures of traffic, transport system, congestions & accidents in Chandigarh tricity. She discussed the need for mass rapid transit system – Metro, Bus Rapid Transit System (BRTS), e-rickshaws public bicycle sharing as a composite plan with last mile connections. Ms. Gurmeet also presented the transport related aspects of Chandigarh’s proposed Master Plan 2031, in addition to the measures being taken for efficient traffic management. She emphasised that infrastructure improvement for non-motorised traffic i.e. making it a pedestrian & cycle friendly city is an essential. The talk was followed by a question answer session & deliberations on Metro’s feasibility. The session was attended by 50 CMA members.